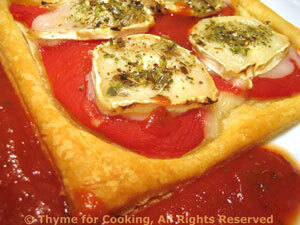 Roasted Red Pepper, Goat Cheese Pastries, Thyme for Cooking gourmet. This is a simple pastry, made with 'pantry' ingredients.... Just assemble and bake. 3oz (90gr) goat cheese a proper goat cheese: log-shaped and wrapped in paper. It will have a thin, whitish, rind that is edible, substitute Brie or Camembert. In a small saucepan heat the tomato sauce, Worcestershire, vinegar, sugar and 1 tsp oregano to a simmer. Open and drain pimientos or red peppers. If whole cut in half or slices. 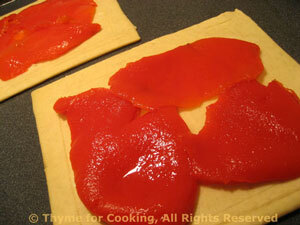 Divide the peppers and arrange within the scored lines on each pastry. Divide the goat cheese and lay on the peppers. Sprinkle with 1 tsp oregano . Bake in a pre-heated oven at 400F (200C) for 12 - 15 minutes, until sides of pastry have puffed up and are golden brown. Remove and serve with Tomato Sauce on the side.